Most people would not choose winter as their favorite time of year. And I don't mean the festive holidays; I'm talking about that long, cold stretch after New Year's and before the first breath of spring. There is at least one very bright spot during winter, though, if you know where to look. January, February and March just happen to fall during the very heart of grapefruit season. Grapefruit season? Yes. Between October and May, the Texas Rio Grande Valley shares its crop of incredibly sweet, tart, juicy, red-fleshed grapefruit with the rest of the state, the nation, and the world. Grapefruit is, of course, grown in places other than Texas. Florida comes to mind. But Texas growers have set their sights on producing the reddest, sweetest grapefruit in the world, and the Ruby-Sweet and Rio-Star varieties being shipped to supermarkets right now are proof of success. The Texas citrus industry is almost completely located in the Lower Rio Grande Valley, located in South Texas. Most of the Texas industry is in Hidalgo County, 15 percent in Cameron County and 5 percent in Willacy County. The South Texas sub-tropical climate, fertile soil, and sunny weather work together to provide excellent growing conditions. Texas citrus growers carefully maintain crop quality through successful irrigation techniques, growing conditions and extensive research. By the way, grapefruit gets their name not because they taste like grapes, but because they grow in grape-like clusters on the tree. What are the benefits of grapefruit? Grapefruit are notoriously good for you. Among lashings of Vitamins C and A, there is also a phytochemical called lycopene which has been shown to reduce the risk of certain cancers. Also, grapefruit are an excellent source of dietary fiber and contain no fat, sodium or cholesterol. A half grapefruit contains about 60 calories. And Texas red grapefruit, which are tree-ripened, are so naturally sweet that adding sugar would be gilding the lily. In a perfect world, we'd have a daily source of fresh-picked grapefruit, but in the absence of such perfection, you can stock up at the supermarket. Grapefruit will keep for at least one week and up to two weeks in a well-ventilated area away from heat -- even longer in the crisper of your refrigerator. Texas citrus growers are understandably proud of their products. Both the Texas Citrus Exchange and the TexaSweet Citrus Marketing Association have excellent web sites offering excellent recipes. The TexaSweet Citrus Marketing site at http://texasweet.com/ features Citrus Guacamole as its recipe of the month, and the Texas Citrus Exchange at http://texascitrusexchange.com likewise includes many nice offerings, among them Texas Citrus Salsa, which calls for both Texas Red grapefruit and Texas oranges. Incidentally, both sites offer a veritable tutorial on the art of sectioning grapefruit, including illustrations that will teach you how to come up with a bowl of perfect, membrane-free grapefruit sections in no time. And, as always, the Horticultural Sciences Department at Texas A&M University is a treasure house of information. See their site at http://aggie-horticulture.tamu.edu/citrus/ if you require proof. Whether you go ahead with any of the recipes that follow, at the very least, enjoy grapefruit while they are at their best. A fine grapefruit at its peak will have a fairly thin skin and, when hefted, feel heavy for its size. Peeled and eaten out of hand, they are delicious. This vinaigrette is an excellent salad dressing that doubles as a fine marinade for chicken, pork or fish. You can double the recipe easily. Combine the fruit juices and sugar in a small saucepan and, over medium-low heat, reduce the mixture by half (to 4 tablespoons). In a small bowl, mix the reduced juice with the grapefruit zest, vinegar, salt and white pepper. Pour the olive oil in, whisking to incorporate. Makes about 1 cup. Ruby Red Chicken Salad is one of my standbys. I recommend it all the time, and my family loves it. In a medium saucepan, bring broth to a boil. Arrange chicken breasts in single layer in pan; return broth to boiling. Cover. Cook 15 to 20 minutes, until chicken is cooked through. Drain and cool. Cut chicken into bite-sized pieces. Meanwhile, cook the pasta according to package directions, with salt. Drain. In a large bowl, combine the chicken, cooked pasta, peas, pimiento, grapefruit sections and juice. In a small bowl or jar, combine the oil, vinegar, garlic, cumin, salt and pepper; mix well. Pour dressing over chicken mixture; toss lightly. Serve warm or cold. Makes 4 generous servings. In a large heavy skillet, heat the oil. Flour the pork chops, and brown them on both sides in the oil, at medium-high heat. Remove pork chops from pan. Add the onion rings to the pan and sauté briefly (about 1 minute). Return chops to pan and add pears and water. Cover pan and cook at low heat for 45 minutes. Sprinkle marjoram over chops; cover pan and cook an additional 20 minutes, until chops are tender and sauce is thickened. Add grapefruit sections to pan, stirring and turning chops until sections are incorporated. Serve immediately. 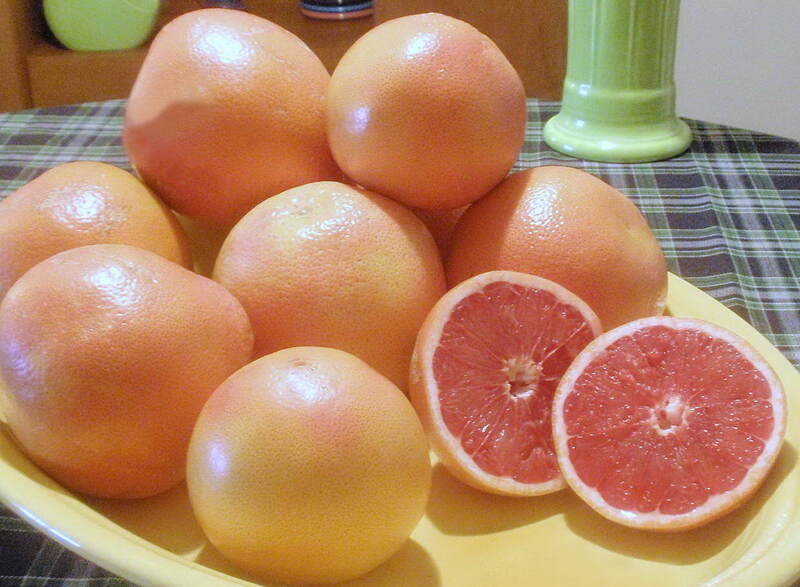 Texans are accustomed to seeing Texas grapefruit in their supermarkets. For those of you who may be more accustomed to Florida-grown citrus, though, I encourage you to seek out the Ruby-Sweet and Rio-Star varieties at your market. I think you'll be impressed.